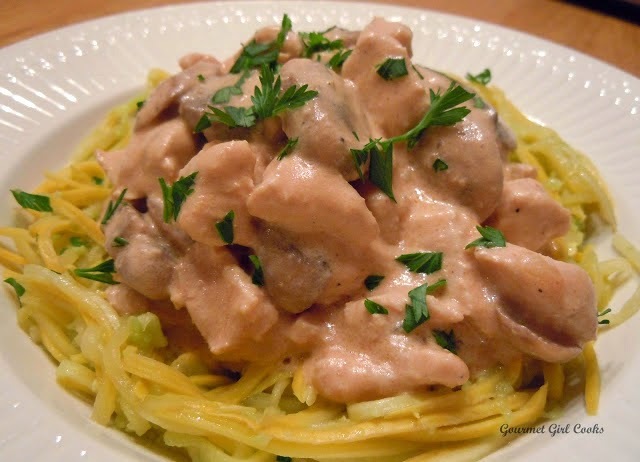 Tonight, I decided to revise the Chicken Stroganoff recipe that I have made at least a buzzillion times over the years. I made several modifications to the original recipe, one of which was removing the wheat flour and then a few other minor changes as well. I also served it on a bed of "hot buttered yellow squash noodles" instead of the wide egg noodles that I used to serve it over. It was absolutely delicious! I used almond flour to make the roux instead of wheat flour for the base of the sauce but it didn't thicken up quite as much as I wanted it to, so I added 1/4 teaspoon of xanthum gum (1/8 teaspoon at a time) to thicken it up just a tiny bit to make it the consistency I was looking for without being able to notice that it was in there. It turned out exactly the way I remember it being. For those that don't have or want to use xanthum gum, 1 or 2 tablespoons of brick style cream cheese should thicken it up enough (I'd start with one first). If you are making this recipe for the first time and don't really have anything to compare it to, you might even enjoy it without adding any additional thickening agent...but I was looking to recreate a recipe that I have made a lot over the years...so I knew exactly what the original version's consistency and taste was and that is what I was looking to duplicate. I suggest tasting your sauce for salt and pepper and adjust as needed to suit your taste. This recipe was a success...hubby said he couldn't tell the difference at all between the original version and the new revised version. I served mine over yellow squash noodles that I made with my julienne peeler and hubby ate his over regular noodles. I've snapped a few photos below as well as the recipe. Enjoy! Season beef or chicken with salt and freshly ground black pepper. Saute seasoned beef or chicken in large skillet with 2 Tablespoons butter or oil until cooked and slightly browned. Add onion and garlic to meat mixture; continue to cook until tender, about 5 to 6 minutes; add cooked mushrooms. Transfer meat and vegetables from skillet to a bowl or platter; set aside. Add 2 Tablespoons butter to the pan drippings, blend in 1/4 cup almond flour; cook 1-2 minutes. Add tomato paste and beef or chicken broth; cook and stir over medium heat until thickened and bubbly. If additional thickening is desired, quickly stir in 1/4 teaspoon xanthum gum (or cream cheese). Add meat and vegetables back to the skillet; mix well. Stir in sour cream and dry white wine; cook slowly until heated through (DO NOT BOIL). Serve over hot buttered yellow squash noodles. Just made this for my family, and wanted to let you know that it was a big hit. Very good! I made it with ground venison and love the rich flavor. Enjoying your recipes. How do you make the squash noodles? Where can I purchase Swerve? I am still trying to figure out how to get the recipes for meals that don't have the recipes listed under the pictures. Please help. These are some really great meal ideas and I just found out that I need to be eating gluten free and would like to try some of the recipes but can't locate them. Hi Cbaggett. I use a julienne peeler I bought from Amazon -- made by Kuhn Rikon. There are others though. You could also use a simple vegetable peeler and make thin ribbons too if you didn't want to but a special gadget. I lightly saute the "noodles in a little bit of olive oil in a nonstick pan with a light sprinkle of sea salt -- only takes 2 or 3 minutes until they are lightly cooked. The Swerve I purchase locally at my Whole Foods -- but I have also ordered it from Amazon and directly from the Swerve website. If you need any help I would be more than happy to help you or answer any questions. Sometimes my posts are not "recipes" but "ideas" -- most of the time I provide a recipe though and if I don't I am more than happy to answer your questions. I wish you good luck on your new "gluten free" journey -- it is even better if you go completely grain free too. Thanks! When you say the mushrooms are "cooked", in what manner do you mean?